It promised to be a holiday somewhat different from the kind I usually take. 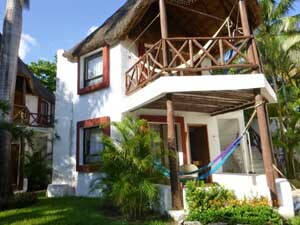 I would again venture to the Riviera Maya, to that incredible strip of Caribbean coastline on Mexico's Yucatan Peninsula, which runs 120 km south from Cancun to the Mayan ruins of Tulum. But this time my companion was to be my 13year-old grandson, Mathias. I recalled the startingly white sand and the warm azure-blue sea with nostalgia, but would these attractions be enough to keep an energetic adolescent occupied for an entire week? I therefore set out to collect as much material as I could on possible entertainment, realizing soon after the start of my search that what I had previously enjoyed doing during earlier hedonistic vacations would no longer suffice. Luck was on my side. Mathias' school holidays were scheduled for late October, a quite extraordinary time in Mexico, when the country celebrates perhaps the most colourful annual event, the Festival de la Vida y la Muerte, the “Festival of Life and Death.” But that was as yet days off and somehow the rest of our holiday time had to be filled. “How about visiting a crocodile farm?” I asked, not knowing exactly what response I might expect. “Great!” was his reply. And so the next morning we caught a collectivo (one of those superb white public vans which, for 25 pesos, take you almost everywhere, sometimes even door to door), and asked to be deposited at the gate of Crococun, a tropical zoo just north of Puerto Morelos specializing in indigenous animals and their habitat. We were both enthralled by Pablo, the parakeet, who laughed hysterically throughout our entire visit and his colourful playmate, Pedro. But I hesitated somewhat when we were next led to an area in which crocodiles roamed freely. We were told to forge ahead, through the assembled group of animals. “Don't worry, Omi, the crocs all have an elastic band on their mouths,” commented Mathias. 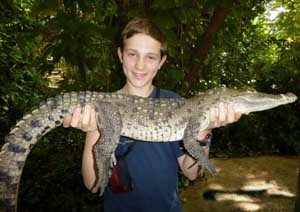 When our guide picked up a crocodile and handed it to Mathias, my daring grandson stood there in shock with his newly acquired bundle, but grinning from ear to ear. Crococun was a hard act to follow but I knew there was another exciting adventure awaiting us that afternoon. Getting to know the creatures of the ocean was a logical continuation. I therefore suggested a short taxi ride to Puerto Morelos, where the Great Mesoamerican Reef (the second longest such system in the world and the longest in the Western Hemisphere) reaching as far as Belize and beyond, lies only 2 meters below the water's surface. Now known as Arrecifes (coral reef) or National Marine Park , this is a protected area rich in flora and fauna, guarded by locals who take great care not to have the reef damaged or touched. We found a fishing boat and guide at one of the piers offering two hour snorkeling trips. Mathias was taken to two shallow sites and saw a great variety of colourful fish-parrotfish, angelfish, grunts, damselfish, brighly coloured anemones, brain coral and sea fans. 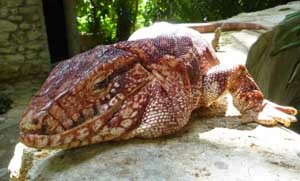 Before leaving Puerto Morelos I had to pay a repeat visit to Ixchel Jungle Spa, a most interesting business venture. A group of Mayan women established a non-profit coop to support themselves and their families by giving Mayan massages. I explained all this to Mathias and he was quite happy to explore the lovely jungle setting, while I was having my sciatic nerve pummeled by magic hands. After this rather busy day, I could see that Mathias was beginning to flag. On our return he retreated to our palapa without supper and I found him in bed by 7:30. My plan was apparently working. However, there had to be more relaxation scheduled during the next day. We then idled in the sun for a few more hours, occasionally refreshing ourselves by splashing about in the ocean, with hourly breaks for papaya and pineapple juice dispensed at the beach bar. Was Mathias getting a bit bored with this inactivity? Time to set off again in one of the collectivos for another unusual destination. The Yucatan Peninsula is dotted with thousands of caves that once housed prehistoric people and later became sacred to the Mayans. 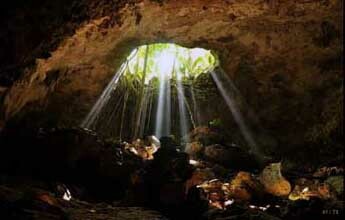 Access to these caves is through sinkholes called cenotes scattered throughout the peninsula under the rainforest. 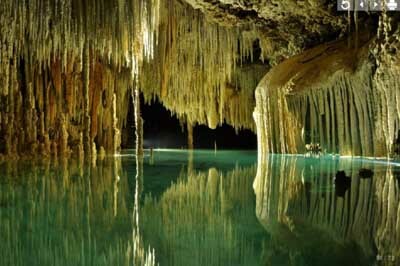 There are dozens of these fresh water swimming pools which lead to caves filled with stalactites and stalagmites. The world's longest river (153km) runs through the limestone caves of the Yucatan and has made them a favourite destination for cave divers. The soft and porous limestone rock, when eroded by acidic rainwater, carves out underground passages of great beauty as the river courses towards the Caribbean Sea. This natural hydrolic system of the Yucatan sustained the Maya for centuries and provided their main source for freshwater. But to the Maya these cenotes were more than a source for their water supply, for they were considered the gateways to the underworld. Objects have been uncovered of human skeletons dating back almost 15,000 years, which appear to have been sacrificed to appease the raingod Chaac. 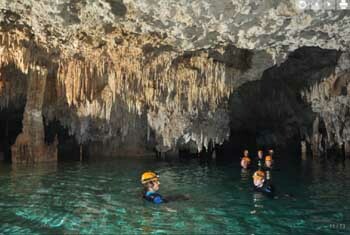 Rio Secreto, near Playa del Carmen, one of the least known cenotes of the Mayas, was discovered in 2007 by an 80-year-old man. Here an underground river stretching nearly 12 km underneath the earth leads to a system of semi-sunken caves carved out over the centuries, accessible not only to expert divers but also to amateur tourists. I read in the brochure that you merely lowered yourself into a sinkhole to discover a breathtaking subterranean world untouched for thousands of years. This was to be Mathias’ next adventure. Mathias, wearing a wetsuit, helmet and life jacket, disappeared from my view with about seven others, trudging through knee-high water. He later told me that before setting off for the underground realm, a traditional Mayan prayer was offered to ask the gods’ permission to enter the cenote and to placate its legendary guardian. “We were told,” said Mathias, “that this is really the entrance to the underworld.” Only after the Mayan ceremony was finished did the group proceed to one of the natural outlets of the cave. At the end of the tour a prayer of thanks for a safe return was said and the entire ceremony was sealed with a small glass of D'Aristi Xtabentun Dulce, a delightful Mayan liqueur of honey and anis. October 30, the day to start celebrating Dia de los Muertes, finally arrived How do you explain to a 13-year-old that the Day of the Dead is a spiritual time when the souls of the departed are allowed to return to the world of the living for a short time ? What can you say about the decorations put on the graves to attract the souls of the loved ones, the candles, the sugar candies shaped like skulls, the round bread loaves called Pan de Muerto which provide sustenance for the soul’s long journey? And what about the marigolds strewn on the graves and on the ground, the scent of which supposedly draws the spirits home? How do you convey the sense of urgency Mexicans feel when the midnight bells ring summoning the spirits home? Will Mathias understand when I talk about barriers opening between the living and the dead? Or about the cyclical nature of life and death and the continuation of life on another plane of existence? All these philosophical questions were not on my mind when we set off for one of the best places to celebrate this holiday- the theme park of Xcaret, south of Playa del Carmen. The Festival of Life and Death runs four days, from Oct 30 to Nov 2 and includes theatre and dance performances, concerts and parades. The highlight, however, is an evening extravaganza showing the history of Mexico in music and dance. We took part in almost everything we found on offer. Later I encouraged Mathias to climb up the steep steps of the Pantheon, the cemetery built on the hill, to see how families decorate the graves of their loved ones. He dutifully followed my wishes, made his way to the top amid the flickering candles and preparations being made for the all-night candlelight vigil. “Is this where the spirits are supposed to return to earth to be with their families?” he finally asked upon his return. I wondered at that point what a 13-year-old was able to extract from all these events. When I asked Mathias he replied, “Instead of mourning and being silent in front of a plain gray gravestone, people here honour the dead with parades, fiestas and parties. 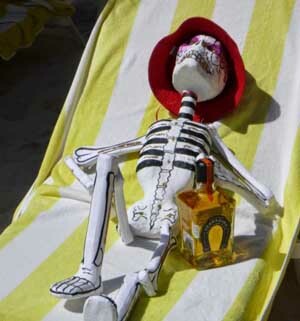 But that's okay- everyone is different!” I think he was beginning to understand that man has always struggled to cope with his mortality and that The Day of the Dead simply showed us how Mexicans do it.